Our Correspondent ● Kolkata: Arko Mukhaerjee’s latest album 5 was recently released in the city amidst much enthusiasm. 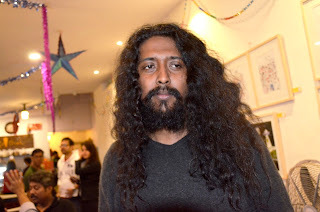 The event at Abaar Baithak drew a sizeable crowd from all parts of Kolkata who swarmed the venue to listen live to Mukhaerjee who is already beginning to stamp his presence on the city’s musicscape. 5 is the singer’s fifth studio album. He is best known for the hugely popular Jodi Akasher Gaye Kaan Na Pati in Srijit Mukherji’s Nirbaak and Maula in Anjan Dutt’s Madly Bangalee. The album has 10 tracks where the singer has collaborated with five world musicians, forming five musical duos that include the likes of French musician Yann Beaujouan, Anna Tanvir from Ireland on the harp, and Ritoban Das on Indian percussion. The album involves the use of folk instruments from different parts of the world. Other instruments used in the album include the rabab, dotara (the traditional Bengali lute), the nylon string guitar and mixed Afro-Cuban percussions, the dubki (a tribal Bengali hand drum), ukulele, the banjolele and the traditional bluegrass mandolin. Mukhaerjee has experimented with traditional folk songs like Chol Mini as well as popular Jasimuddin and Rabindranath Tagore compositions. His Paal Uraiya De is already a chartbuster and the live gig of the track called for an encore from the audience.